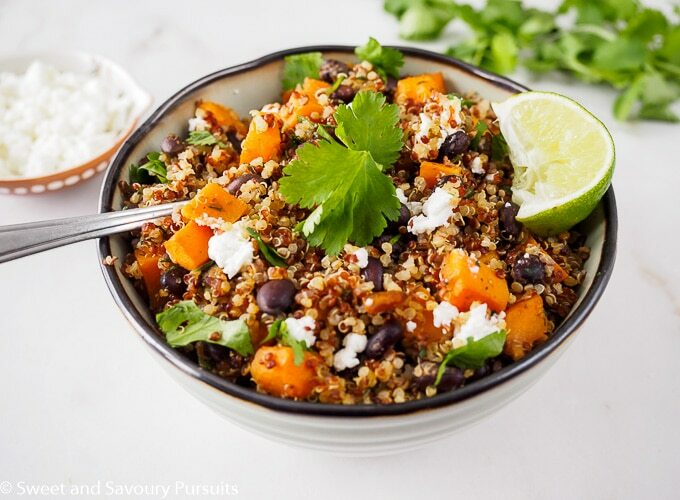 This delicious Sweet Potato and Black Bean Quinoa is a hearty meatless meal loaded with flavourful and healthy ingredients. Quinoa has become one of my favourite ingredients to incorporate into my family’s diet. 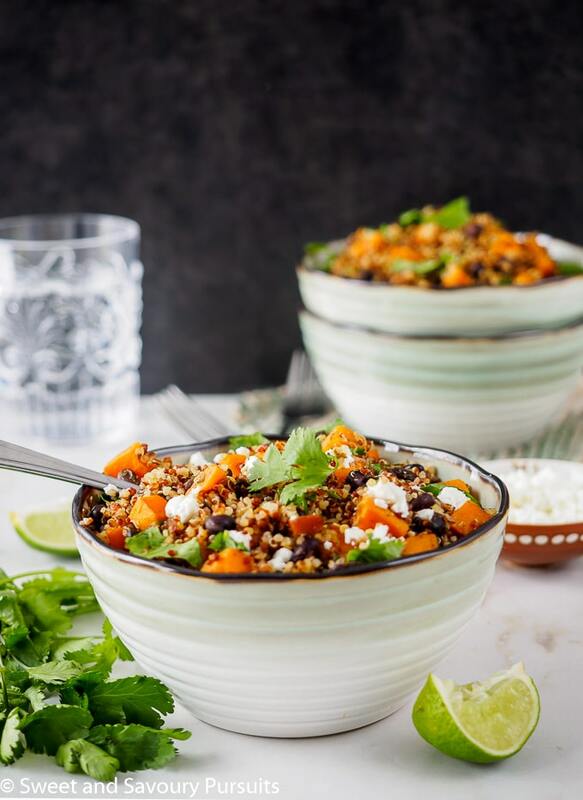 It’s full of complete proteins and provides us with a good amount of fibre as well as a plethora of minerals and vitamins (read here for more on the health benefits of quinoa). What I love most about quinoa is how versatile it is and how well it goes with so many different ingredients. 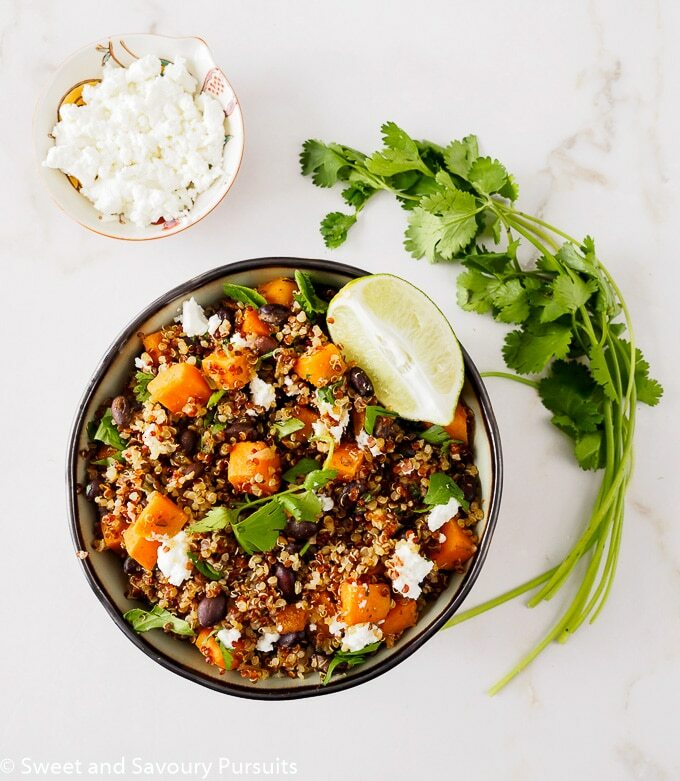 In this dish, I’ve combined quinoa with aromatic ingredients such as onions, garlic, and jalapeño and added sweet potatoes and black beans for the additional texture, flavour and nutrion they give to this meal. The result is a delicious, hearty and satisfying vegetarian meal (even vegan if you omit the cheese). Though it takes a bit of chopping, this dish comes together easily and quickly. If you start prepping your other ingredients while the quinoa is cooking you could have this meal ready in just over 30 minutes. In my book, that makes it perfect for a weeknight meal. 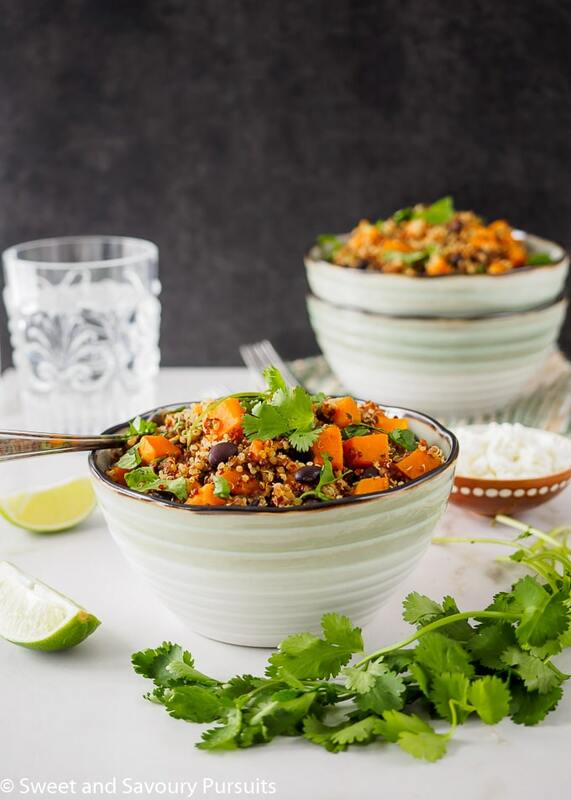 To make this sweet potato and black bean quinoa even more flavourful, I added a bit of the spices I used in this dish to the water I was cooking the quinoa in. This really increased the flavour factor and ensured that every bite was super tasty. Fresh cilantro is added at the end of cooking. If you wish, you could serve this quinoa dish with some wedges of fresh lime and some crumbled goat or feta cheese for some added zing. Enjoy! Rinse the quinoa in a fine mesh colander with cold water. Drain the quinoa and transfer to a medium saucepan. Add the water, salt, cumin, chili and coriander. Bring to a gentle boil, reduce the heat to medium-low, cover the saucepan leaving the lid slightly ajar and simmer until the water has been absorbed and the quinoa is cooked, approximately 12 to 15 minutes. Remove the quinoa from the heat but leave it covered. Meanwhile, finely chop the onion, the garlic and jalapeño. Chop the sweet potato into a small-medium dice. Over medium heat, heat the oil in a skillet, add the onion and cook a couple of minutes until the onions begin to soften, stir and add the garlic and jalapeño. Cook for a couple of minutes or until softened and add the salt and spices, give it all a good stir. Add the sweet potatoes and water to the skillet, simmer for about 12 to 15 minutes, keeping an eye on the water level in the skillet and the doneness of the sweet potatoes. If the water is absorbed before the potatoes are cooked to your liking add 1/4 cup of water and continue to simmer. Once the potatoes are cooked thru add the black beans to warm them. To finish add the cooked quinoa, cilantro and adjust the salt to your taste. Serve wedges of lime, crumbled goat or feta cheese and extra chopped cilantro on the side. This dish will make 4 full servings or 6 side servings. I will definitely make this tomorrow! Thanks for sharing! My pleasure, hope you enjoy it! Great idea to add some of the spices to the cooking water – double up on that awesome flavor! I always love when you can have a dish that’s healthy, delicious, and filling – it’s like the perfect trifecta! I completely agree, wish it could always be that way! This dish looks fantastic. Yummy, yummy, yummy! Thanks so much Noel, so happy you like it! This dish looks so good and I love how colorful and healthy it is! Thanks Nancy! I agree, I love the brightness of the sweet potato, makes the dish come to life and it’s so good. That is a gorgeous bowl of goodness. Your photo is just beautiful as well. I have never been able to successfully make quinoa, weird right. I usually end up subbing a grain like farro or something. Not sure why I am challenged when it comes to quinoa. Love how this recipe sounds. Thanks Suzanne! Actually, funny thing I have the same issue but with rice, it’s hit and miss with me! I think the problem might be the quantity of water, I think it’s better to be conservative with the water, you could always add more water if the quinoa isn’t cooked (once the water is all absorbed). So healthy and so beautiful! This looks fantastic!